Hundreds of attendees enjoyed food and beverages, health screenings. 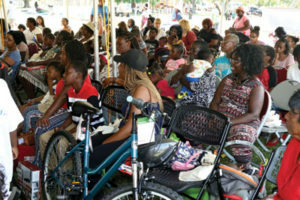 LAUDERHILL, FL — The Children’s Services Council (CSC) of Broward County, in partnership with dozens of community organizations; held its annual Family Fun and Resource Fair was held April 14 at Rev. Samuel Delevoe Memorial Park in Fort Lauderdale in recognition of Child Abuse Prevention Month. Now in its 10th year, the Family Fun and Resource Fair concluded the 2018 Annual Broward AWARE! Protecting OUR Children Campaign—a four-month series of events dedicated to strengthening families and ensuring the community knows of programs and resources that can help prevent child abuse and neglect. With Rodney Baltimore of Hot 105 as Master of Ceremonies, hundreds of attendees enjoyed food and beverages, health screenings (including eye exams), raffle prizes, games, mini-workshops and resources on keeping children safe and healthy, all free of charge. Children moved through a 135’ inflatable obstacle course and posed for fun photos courtesy of Bikers Against Child Abuse. South Florida’s own Emmy-nominated singer/songwriter Alexander Star gave a rousing live performance with a medley of popular songs. Dr. Rosby Glover, executive director of Mt. Bethel Human Services Corporation, was honored with the 2018 Alan and Marsha Levy Champion of Child Abuse and Neglect Prevention Award presented by Judge Kenneth L. Gillespie. The event also included a moving tribute to the late Nancy J. Cotterman, the original organizer of the Family Fun and Resource Fair and for whom the Broward County Nancy J. Cotterman Center; formerly the Sexual Assault Treatment Center, was named. Special thanks to the Bro-ward County Parks’ & Rec Municipal District staff, Rodney Baltimore, Bikers Against Child Abuse, Men of Mt. Bethel, Alexander Star, YMCA of South Florida, Seeing the World Clinic, 99 JAMZ, Water Smart Broward, Broward Health, BSO Fire & Rescue, and everyone who helped to make this year’s Family Fun and Resource Fair a success.